Massey Ferguson is part of AGCO Corporation and is one of the biggest names in farm equipment throughout the world with a 150 year history. Products that are easy-to-use; durable and productivity-focused to maximize your ROI. If you pride yourself on the most perfect cut on your block and enjoy creating ballpark style lawn striping patterns, it is high time you check out the latest offerings of Simplicity lawn mowers. STIHL Inc. manufactures over 260 model variations of handheld outdoor power equipment for sale in the U.S. and around the world. STIHL products are sold through a network of over 9,000 servicing power equipment retailers from coast to coast — not mass merchants. Welcome to Harmony Outdoor Equipment! This dealership has been providing the surrounding area with quality products and service for over 60 years. 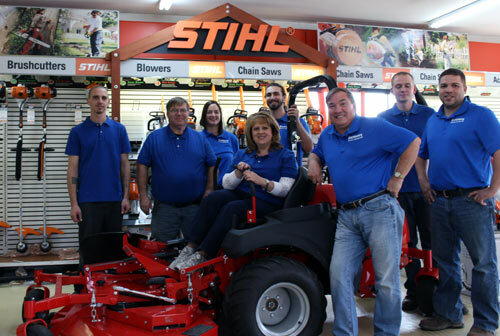 In 2007, the current owners, Don, Diane and Brian purchased the dealership bringing over 35 years of power equipment experience. We take pride in selling the highest level of products on the market today. We carry Massey Ferguson compact and utility tractors. Toro's full line of residential and Landscape Contractor Equipment, Simplicity, Stihl, Woods, and Land Pride Products. Harmony Outdoor is proud to have a staff that is knowledgeable, friendly and experienced and who share the vision of providing our customers with the best products and service available. So if you're in the market for a compact tractor, zero-turn mower, push mower, riding lawn mower, leaf blower, snow blower, trimmer, tiller, lawn vacuum, chainsaw, backpack blower, generator, or power washer, please stop in and see us... we'd love to talk with you! "We are commited to providing our customers with quality products and family friendly service." Plus many more... please call us!